Like regular teeth, your dentures must be cleaned and rinsed daily to remove food particles and prevent stains from drinks, food or nicotine. But dentures need special cleaners that differ from regular toothpaste. 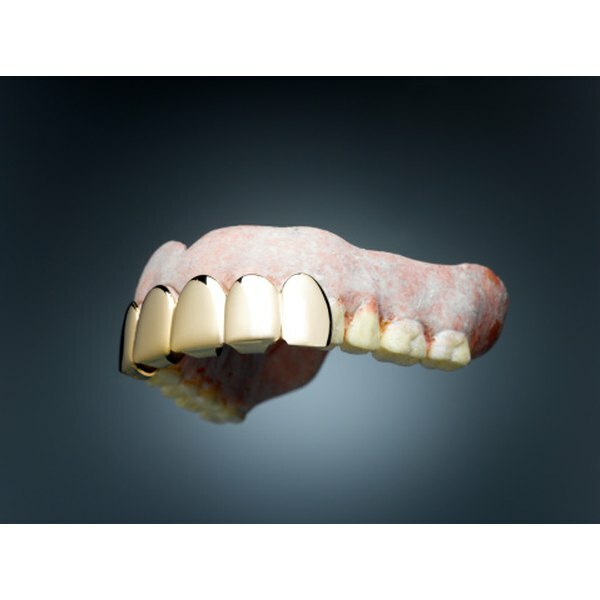 Modern dentures are made of plastic, porcelain and acrylic. These materials are porous and tend to be easily stained by regular foods, which is why you must be vigilant about removing stains. Rinse your dentures with water after every meal or drink to keep particles from settling on them and staining. Clean your dentures twice a day with a denture brush and denture cleaner. If your denture kit didn’t include a denture brush, use a soft-bristled toothbrush. Anything else might scratch the surface of the dentures. You can also use dishwashing liquid or a mild soap in place of denture cleaner. Squirt out a small bit of soap or cleaner onto your brush, wet it with warm water and scrub the dentures, concentrating on areas between the teeth and on visible food particles. Soak your dentures every night. Place one effervescent soaking tablet in a glass of water (the amount of water may vary depending in the brand of denture soak), and allow the dentures to sit in the solution all night. If your dentures have metal attachments, make sure your dental soak doesn't contain chlorine, as it could tarnish the metal. In the morning, rinse your dentures thoroughly with water before placing them in your mouth. Soak your dentures in a vinegar and baking soda solution once a month to get rid of hard-to-remove stains. Mix together 1 cup of vinegar and 1 tbsp. of baking soda. Allow the dentures to soak in the mixture for five minutes. Add more vinegar if necessary to make sure the liquid completely covers your dentures. Remove the dentures and scrub with a denture brush. Rinse in warm water. MayoClinic.com: Denture Care: How Do I Clean Dentures? How Do I Disinfect a Dental Night Guard?